Fast And Easy FETTUCCINE PRIMAVERA: Molto bene!!! Think “fettuccine” and the word “fattening” probably comes to mind. Well, if you want fettuccine alfredo, then “heart attack on a plate” is an appropriate leap. But the high calories and cholesterol come from the butter and cream, not the pasta. The noodles themselves are only about 210 calories per 1½ cup of cooked fettuccine. Fettuccine Primaverde is one of those dishes I make when I want something light and/or fast. Washing and chopping the veggies is the longest part – cooking is done in about 5 minutes. If you make the pasta noodles (which I do), then it takes a bit longer. The last time I made Fettuccine Primaverde I used leftover fettuccine pasta from the night before, so I enjoyed the benefit of homemade noodles without the effort. Dinner was ready in 20 minutes! This recipe makes enough for 3-4 people, depending on how large the portions are. If you purchase the pasta, cook the amount you’ll need. If you’re making the pasta, use 1½ cups flour and 2 eggs. Melt butter and oil together in 10″ skillet. Add in garlic and cayenne pepper. Sauté for 1 minute. Add in mushrooms, asparagus, and red pepper. Sauté about 2 more minutes. Add in vegetable stock and olives. Bring to a low boil. Let cook another couple of minutes. Test the asparagus – when it can be pierced with a fork, but is NOT mushy, it’s finished. To serve, pile fettuccine pasta in a bowl or on a plate and ladle veggies over it. Sprinkle on cheese and pine nuts. 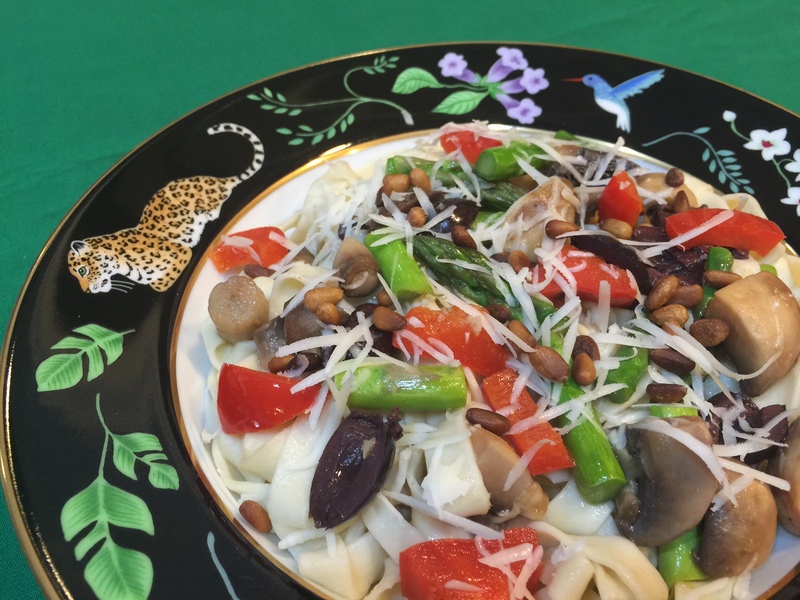 This entry was posted in Main Dishes and tagged Bonnie Antonini, easy fettuccine, Fettuccine Primavera, light fettuccine, pasta dishes, Vegetarian Cooking For Carnivores, vegetarian recipes. Bookmark the permalink. ← When Life Sends You Lemons…Make LEMON ZINGER CUPCAKES!